Is the Saviors Prophecy Coming True Right Before Our Eyes? You will remember the parable Jesus taught referred to as the “Parable of the Ten Virgins”. The parable, found in Matthew 25: 1-13, tells the story of ten women who took their lamps and went to a wedding festival. While waiting for the bridegroom, the five foolish women slept instead of seeking out oil for their lamps. At the time of the bridegrooms arrival, the five women who had been sleeping sought out the other five women and asked to share their oil. But it was too late. The oil could not be shared and there was no time to gather oil for their own lamps. Those women that had oil in their lamps were admitted to the wedding festival, while the five foolish women were told by the bridegroom, “I know you not”, and they were not admitted. 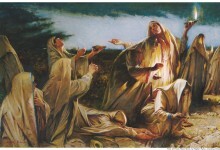 The symbolism of the story suggests that the wedding festival represents the Second Coming, the bridegroom represents the Savior, the five wise women are those who dutifully prepare for the coming of the Lord, while the five foolish women represent those that don’t do all they should to prepare for the Second Coming. President Wilford Woodruff boldly declared that the Savior, through this parable, was speaking directly to the members of the church. He stated that the five foolish women were members of the church who probably fully expected to be admitted into the Kingdom of God. In speaking of this parable, Elder James E. Talmage stated, “One must make a conscientious preparation beforehand to be ready at the coming of the Lord. To be unprepared through neglect or carelessness is to be denied a place at the marriage supper”. Brothers and Sisters, we have been hearing about the “hastening of the work”. We have been told that we are witnessing the fulfillment of the Lord’s promise to hasten his work before his Second Coming. While I do not wish to distract from the imperative message of hastening our efforts to bring more people into the fold of The Church of Jesus Christ of Latter Day Saints, I do wish to suggest that a “hastening of the work” needs to occur within our own lives and within our own homes. The time is short and we must hasten our efforts to be prepared for the Lord’s return. We must continue, and even increase our efforts, to do the simple things the Lord has taught us to do. We must pray, we must study our scriptures, we must teach our children to do the same. We must be more faithful, more devoted, and more committed to do what is right and to shun more frequently and with greater strength the things that distract us from the path that leads to true happiness and the path that leads us back to our Heavenly Father. We must fill our lamps to overflowing levels!